those berry baskets are fantastic! Hello Amy ! Thank you so much, I am happy you like my little wedding couple! I looove your art, but you already know that!! Have a great day! Hhhmmm...gives me an idea about painting my own (even if not berry) baskets. These are adorable! super super cute berry baskets! love the bright colors. I thought I'd seen all the wedding related mustaches and garlands, but those eggs are beyond cute! I love the colored berry baskets, what sweet finds! 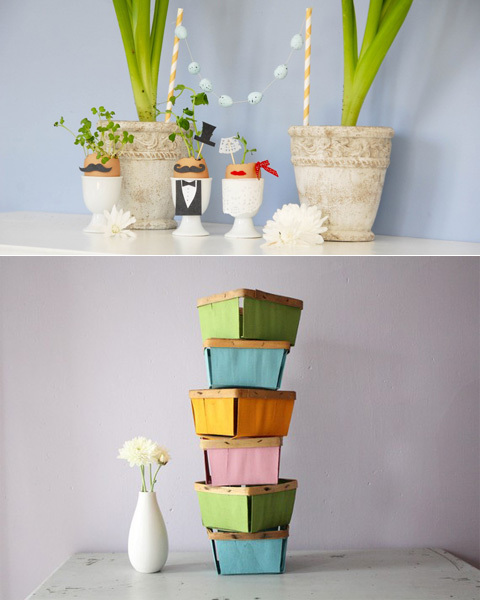 Love these baskets - delicious colours..! Those egg shells are adorable. So using that idea for a brunch at each place setting with herbs sticking out the top, and my guests names on them. Just perfect. Your article ‘A Lot of Life Ahead’ great and that is a true all activity affect a much larger number of our university students. You down a great job. Thanks for sharing……. the article is good and easy to understand develop again to post more interesting..